I created this blog in August 2012 to publish my investigations into the so-called “Secret files on ME”. It was set up rather hurriedly in order to counteract some misinformation which was circulating at the time. My work was not finished when I started the blog and it took me some time to complete the process. In the absence of any proper treatment for Myalgic Encephalomyelitis or ME (also known, unhelpfully, as “chronic fatigue syndrome” or CFS), my health continues to deteriorate and my progress is painfully slow. 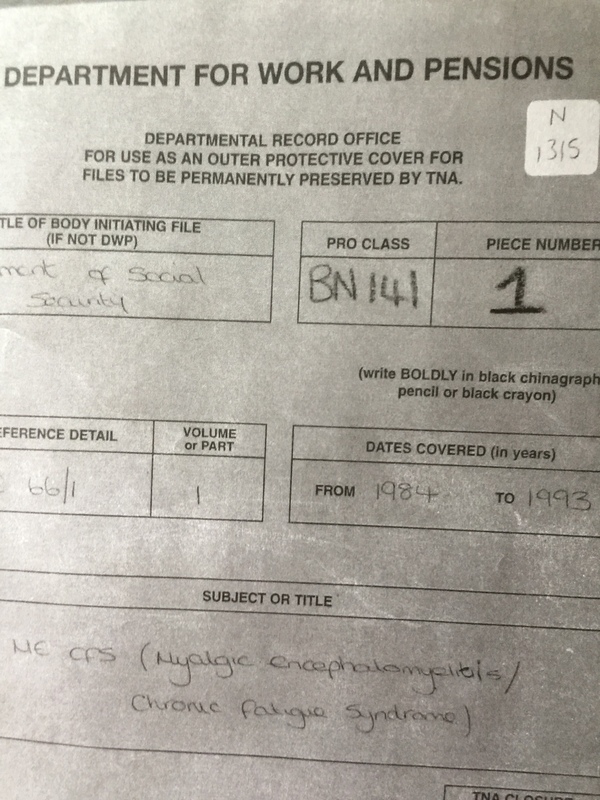 For several years, there had been considerable speculation and rumour surrounding some “secret” files on ME (the illness I have lived with since 1981) which are held in The National Archives (TNA) at Kew in London, UK. In September 2011 I decided to use the Freedom of Information Act of 2000 (FoIA) to see if the files could be opened up. It transpired that there were two files – one from the Department of Work and Pensions (DWP, formerly known as the Department of Social Security – DSS) and one from the Medical Research Council (MRC). The files contain documentation about ME (correspondence, notes of meetings, background material and details of benefits claims/research applications). Both files had been reviewed and archived in the normal way during the 1990’s. Because each file contained information which was properly exempt from disclosure under the Act, they were closed to the public until 2072 (DWP – pictured above left) and 2071 (MRC). It was always my intention to upload the files here as soon as I was able. Both files can be found elsewhere online but not everyone who has an interest will necessarily have been able to access them. My aim is to make them more widely available for academic, educational and research purposes. They stand in their own right as historical records relating to the formulation of UK policy on ME/CFS (sic) during the 1980’s and 1990’s. Accurate historical records play a crucial role in every democratic society. To the best of my knowledge, no official record exists which truthfully documents patients’ experience of living with ME. The illness itself has been documented since the 1930’s Los Angeles outbreak in the US. It was accurately described by doctors following the “Royal Free disease” outbreak in the UK in 1955. Eighty years on, despite the existence of these (and many other) records, the real nature of the illness is still effectively denied by many doctors, either actively or simply by default. Patients are still stigmatised and abused; the illness is still not properly recognised, the result being that there are still no officially-approved treatments available anywhere which actually treat the condition and address its wide range of symptoms. The complete absence of a visible patient narrative became painfully evident last week. The mainstream British media’s wilfully ignorant coverage of ME patients’ perceived “fear of exercise” gave the headline writers a field day (examples here and here). Journalists appear to have regurgitated mindlessly a press release from the Science Media Centre’s relentless propaganda machine and failed to make any responsible enquiry into the real story. Subsequent rebuttals from the charities limped in on the back foot; positive and corrective commentary was drowned out in the general furore; patients and supporters rallied but we were all too late to the party. Why? How could this happen yet again? Because it can. Because that real story – patients’ actual lived experience – is invisible and therefore not officially documented. Accounts of individual patients’ experiences appear occasionally (usually in local media or the comment/blog sections of national media) but their impact is relatively low and they may even serve to normalise – rather than flag up the scandal of – the way in which the condition is treated and portrayed. Chronically sick ME patients are not up to the Herculean task of funding and managing a long overdue strategic initiative to disseminate our real story pro-actively and deflect negative publicity effectively. But without such a campaign in place, it will happen again; we will remain without a platform from which either to speak or to generate our own record for the archives. Do media stories really matter? Yes, of course they do – because those stories are subsumed into the source materials which constitute our collective history. If there can be no aggregation of fair and accurate records, then history is falsely written and becomes a mere propaganda tool. So – back to those files, which form part of the UK’s official record of ME policy development and remain, so far, officially unchallenged. Reading them is a deeply distressing experience. In an effort to minimise the impact on my health of writing this post, I have not re-read them recently. I’m therefore posting them without further discussion. Both files are quite long so I am going to spread them over two posts. Both still contain redacted portions for reasons which are explained in my original post (see link in second paragraph of this post). The link at the foot of this post is for the DWP file (previously the Department of Social Security – DSS). It is 235 pages long and is described as follows on the title page on TNA’s website: “Medical policy formulation; consultation with medical experts and advice from Board of Doctors“. The illness is described as “ME CFS (Myalgic Encephalomyelitis/Chronic Fatigue Syndrome)” and the dates covered are 1984-1993. There are two ways of viewing this file. One is to visit TNA at Kew in south-west London and view the original; the other is to look at a photographic version of the file, such as this. Taking photographs of 235 already rather blurry pages was a laborious process and unfortunately the image quality is not the best. However, I hope that readers will be able to garner the information they need. I will upload the other file (the MRC file) in Part 2 of this post. This is essential reading. The media has a huge responsibility for societal development. Are they shouldering that responsibility at this point in time? We don’t think so. Very many thanks for posting this, Valerie! It looks to be about as lurid and discreditable as we expected it to be. I look forward to part 2. Thanks for these. I started reading without having realised that these are the same files you drew our attention to previously… seems that I have forgotten half of them. Thank you for this vital activist work. When I have the energy, I will look at this in more detail. Thank you to everyone for your comments. I am not up to replying to everyone individually at the moment but I really appreciate your interest and thoughts. Best wishes to all.